Not only is Proportional Representation more democratic, it’s used by all the world’s most progressive and equal societies. It’s time for Labour members to make their voices heard so the UK can become a democracy - and society - “for the many, not the few”. Keep up to date - sign up to our mailing list! + Why should Labour support Proportional Representation? The arguments for Labour to back PR are overwhelming. To find out what they are, read our joint report with the Labour Campaign for Electoral Reform, or invite an expert speaker to your local Labour Party branch or CLP. + Why invite a speaker to my branch? Our expert speakers are all members of the Labour Party who believe fair votes are crucial to delivering the equal, progressive society that Labour is committed to. Hosting an external speaker is a great way to get the debate going and find out what local members think about electoral reform. You'll probably be suprised how much support there is! + Can I invite a speaker to my trade union branch? If you're a trade union member and would like to invite a speaker to your local branch, visit Trade Unions for PR. + Why put forward the motion to the National Policy Forum? The National Policy Forum (NPF) is the Labour Party's policy-making body. The NPF regularly consults the party membership on a range of policy issues. We are encouraging CLPs to pass a motion calling on the NPF to consult the party membership about Proportional Representation. Many dozens already have. Such a consultation would allow the party to have an open debate, democratic debate about whether to back PR, in the spirit of a the "member-led movement" that Labour has committed to becoming. + How can I raise a motion? 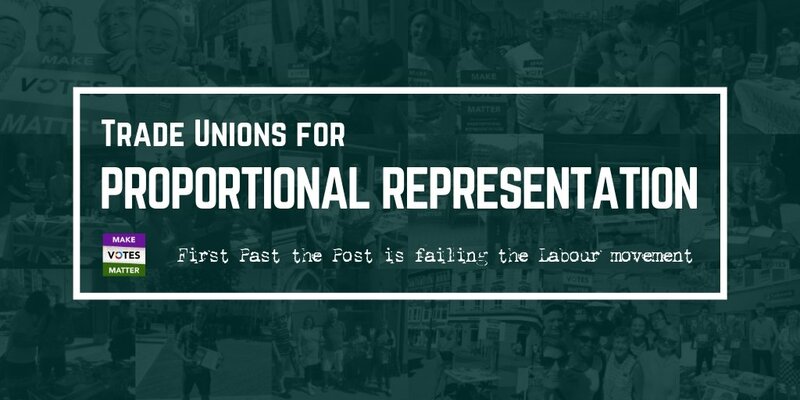 Email the Chair or Secretary of your local branch, including the text of the motion you want to put forward and saying you would like to table it at the next possible opportunity. At the next meeting, you will have the opportunity to say why you think the branch should support the motion (we can help with this if you like!) - and time will be set aside to discuss the issue. The branch will then vote whether to pass the motion. If the motion is passed, it can be sent to the next meeting of your Constituency Labour Party (CLP) where the same process takes place again. If the motion is passed at the CLP meeting, congratulations! You've done the most important thing any of us can do to make sure we win fair votes in the UK. If you need any help with this, contact us at labour4pr@makevotesmatter.org.uk. + What is LCER? Why should my branch or CLP affiliate? LCER is the Labour Campaign for Electoral Reform, the internal Labour Party campaign for PR. Affiliating your branch or CLP is a great way to show your support for this issue and support the campaign. It costs £10 per year for a CLP or branch to affiliate with LCER. Contact emaillcer@gmail.com for details. + Can I join LCER as an individual? Yes. Click here to join. + Will there be a motion to send to the Labour Party conference? Yes. We will be sharing a draft motion to the Labour Party conference later in the year. Note that as of recent rule changes, more time will be set aside at conference to debate motions, and motions will no longer need to be "contemporary". + Which Constituency Labour Parties have already passed motions for PR? The following 57 CLPs have passed motions calling on Labour to back Proportional Representation. Bath; Battersea; Bedford; Bishop Auckland; Bognor Regis Littlehampton; Brentford Isleworth; Brighton Kemptown; Bristol West; Broadland; Camberwell Peckham; Cardiff West; Carmarthen West Pembrokeshire South; Chichester; Clacton; Colne Valley; Corby; Cornwall North; The Cotswolds; Crewe Nantwich; Daventry; Devizes; Eastleigh; Edinburgh Central; Glasgow Cathcart; Gosport; Guildford; Harwich Essex North; Hastings Rye; Herefordshire North; Holborn St Pancras; Houghton Sunderland South; Lewes; Lewisham West Penge; Milton Keynes North; Milton Keynes South; Morecambe Lunesdale; Newark; Oxford East; Oxford West Abingdon; Plymouth Devonport Sutton; Romsey Southampton North; Ruislip Northwood Pinner; Sheffield Central; Shoreditch Hackney South; Sittingbourne Sheppey; Southampton Itchen; Southampton Test; Southend West; Stroud; Suffolk South; Sutton Coldfield; Taunton Deane; Totnes; Truro Falmouth; Warrington South; Witney; Wycombe. Pink constituencies have hosted speakers. To find out why PR is in the interests of Labour MPs, activists and voters read our report, jointly written with the Labour Campaign for Electoral Reform: The Many Not The Few: Proportional Representation & Labour in the 21st Century. 76% of Labour voters said they would support a manifesto commitment to Proportional Representation.